Oh Franz Ferdinand, how I've missed you! Ever since the 2002 hit "Take Me Out" hit the airwaves, this Scottish indie rock band has ranked high on my list. Their new album, Right Thoughts, Right Words, Right Action now streaming in advance of the release date on KCRW, marks a welcome return to those first songs of high energy fun. Their behind the scenes video, posted here back in June, shows that the group's bond seems as tight as ever. The band camaraderie was also evident when the group appeared for a live session on "Morning Becomes Eclectic" back on July 30. They tore through the new songs and revisited "The Dark of the Matinée" from that first self-titled album. At times the quartet sounded scrappy, but at least it was clear they all have a healthy pulse. Besides, it's easy to forget that these gigs at the Los Angeles radio station are recorded before noon, even as I was thrilled to be able to listen in and watch it all live as it was happening from the East Coast. 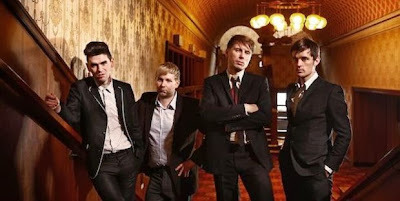 Links for both opportunities to hear the new Franz Ferdinand songs are listed below. Listen to the "Album Preview" (before the release date of August 27 via Domino Records) here. Listen (or even better watch) their session in the KCRW studio here.